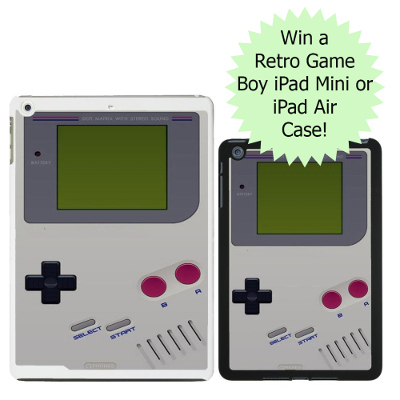 Win a Game Boy iPad Air/Mini case! As you can probably tell, being massive Retro Gaming fans, we have a special place in our hearts for the Game Boy. Nintendo’s handheld with it’s 4 colours and vast array of games changed the world, and it’s no surprise the author had a Game Boy with a range of games (Super Mario Land, anybody?). The original console – initially available only in grey casing – was given a set of fresh new skins in the early 1990s. However, we do love a good classic here at Retro Garden, so we’ve got an iPad case featuring the original colourways up for grabs. We’ve been given the chance to giveaway a Game Boy iPad Air/Mini case to one lucky Retro Garden fan courtesy of Cash Generator, a high-street retailer who sells cheap second-hand iPads. So how do you get your hands on this iPad case? It couldn’t be simpler: there are many ways to (UK entrants only). Simply follow the instructions below to enter. The winner will be selected from all entries received within 3 days of the giveaway closing – good luck!